Dance Routes was founded in 1997 by performer, choreographer and researcher Rekha Tandon, and British composer and videographer Michael Weston. It was based in Bhubaneswar, Odisha for thirteen years, where it undertook extensive experimentation, research and documentation. The objective was to expand the physical parameters of traditional odissi practices, and ground it in a yoga-based, integrated way of life. 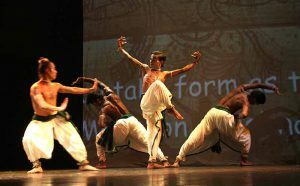 In 2013, Dance Routes moved to the neighbourhood of Auroville, and then built Skandavan, where the company is now located. It has created several full length productions, and many short choreographic works, both for solo performance and for its repertory group, using multicultural literary and musical resources. ‘Postcards from the Past’ – a short promotion by Michael Weston, music ‘Guruji’ sung by Pandit Kumar Gandharva. Rekha both taught and performed extensively with Madhavi Mudgal’s dance company between 1985 and 1993. 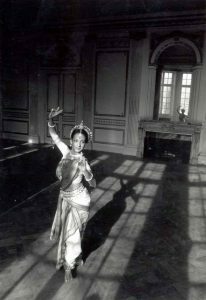 In 1995 she began work independently by revisiting several iconic pieces from odissi’s early repertoire, and recreating these as variations such as battu, the mangalacharans Namami, Manikya Veena, Pada Vande, and the Odia abhinaya Pathchadi de. 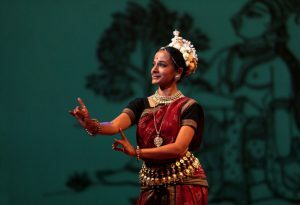 Mukhaari pallavi was choreographed by Guru Trinath Maharana on Rekha providing a valuable opportunity for her to experiment independently with articulating odissi’s sound-movement nexus. 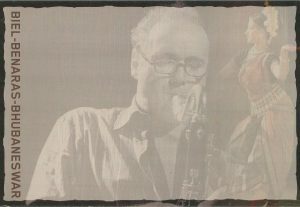 Subsequently, several solo works using texts in English and Braj Bhasha were choreographed to contemporary musical scores by Michael using traditional ritual elements, examples of which are below. 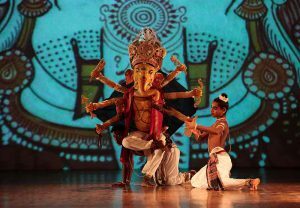 An invocation to the elephant-headed God Ganesha; it is based on traditional choreography created in the 1950s by Guru Kelucharan Mohapatra, altering its pneumonic patterns and use of space to embody a ‘spatial yantra’ during its performance. An exploration of rhythmic patterns and melody, based on the traditional choreographic form of the pallavi. 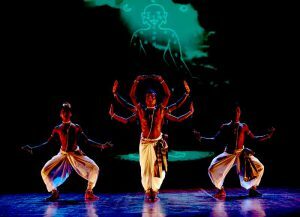 This piece was created through one-to-one sessions over a year between Guru Trinath Maharana and Rekha, where he both composed the pakhawaj score and directed the choregraphy on Rekha’s dancing body. Moksha seeks to centre the energies of the body through symmetric sequences of both music and movement in dance. The piece was video filmed at the Jaipur Mandir, Vrindavan, UP, by Michael Duffy and Michael Weston. This poem, written by a 16th century mystic poet called Surdas, describes a state of yearning experienced by the young milkmaid Radha for the beautiful Shyama/Krishna. The love of Radha for Krishna, a popular theme in the Indian arts, symbolises the desire of the individual soul for God and is sung here in the thumri style. The piece was video filmed in the groves and on the banks of the Yamuna river in Vrindavan, UP, by Michael Duffy and Robyn Beeche. The Gitanjali was written by Rabindranath Tagore and expresses the intimate relationship between himself and God, for which he won the Nobel Prize for Literature. The verses were originally composed in Bengali, but were translated into English by the poet himself. 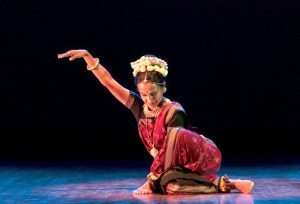 This piece interprets a selection of verses using odissi’s traditional techniques of rendering meaning through movement. 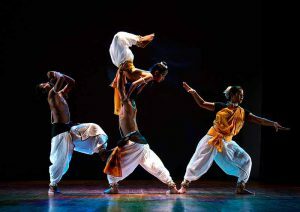 The piece was video filmed in the British Council Theatre, New Delhi, by Michael Weston under the direction of Papa Rao. 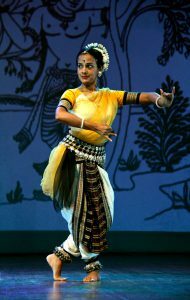 A danced conversation in odissi movement that describes the power and beauty of the Divine Mother as Saraswati, embodiment of wisdom and kundalini energy. The prayer is taken from ‘Hymns to the Goddess’, translated from Sanskrit into English by Arthur and Ellen Avalon. Phenomenal Woman is a cheeky poem by Maya Angelou that celebrates a woman’s spirituality through a description of the female body. The concepts and spatial patterns developed for a previous work, Akash Yantra, are rendered into a dance space that is experienced as ‘yoga-dance’. It is performed to a refrain of beej mantras, or seed syllables, used in the tantric tradition of Devi worship. 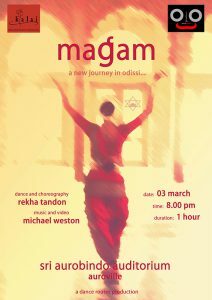 Based on the classical odissi pallavi in Raag Bilahari choreographed by Guru Kelucharan Mohapatra, melodic phrases and movement patterns are used to colour readings from Rabindranath Tagore’s Gitanjali, describing a danced conversation between the soul and its mentor. The piece is based on the iconic choreography by Guru Kelucharan Mohapatra for this ashtapadi from the Gitagovinda. In this presentation, the music was recomposed by Shiba Prasad Rath and accordingly, the movement material reinterpreted to suit the new score. An interpretation of a traditional Odishan song describing the playful relationship between the secret lovers Radha & Krishna through a chance encounter in the forest. This piece was accompanied with pattachitra line drawings by Rabindra Nath Sahu. In 2005 the Dance Routes repertory group was formed. 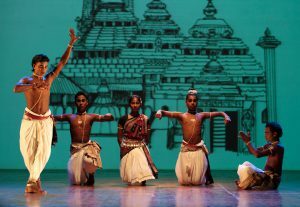 Its dancers were initially drawn from the gotipua tradition in Raghurajpur, Guru Kelucharan Mohapatra’s home village near Puri in Odisha. 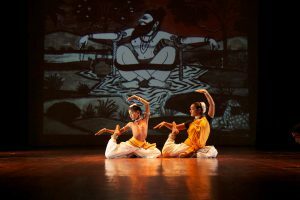 These had been trained by Dance Routes for a performance project that combined pattachitra painting and dance, supported by the Indian National Trust for Art and Cultural Heritage. Subsequently, dancers from other surrounding villages joined and ‘Dhara’ and ‘Yatra’, two full length productions, as well as several short commissions were created over a period of eight years, of which selected material is described below. So Ham is a meditative exploration of acrobatic movements prevalent in the gotipua tradition, tracing its origins to hatha yoga. It is both an invocation to latent energy in the body and a physical preparation for dance. The sound track is based on traditional chants used to accompany yoga practices and meditations. This is a visitation by multi-armed Devi Durga wearing a traditional mask, to the accompaniment of both folk and classical instruments. The piece builds on sahiyatraprocessional movements and gotipuastory telling, to describe Her epic slaying of powerful demons that threaten the peace of the world. Based on verses written by the 16th century mystic poet Chaitanya Mahaprabhu describing Jagannath as none other than the Krishna of Vrindavan. The piece praises the Lord as He steps out of His Temple Palace in Puri, on the annual chariot festival. The composition was originally created as a solo for classical odissi by Smt. Madhavi Mudgal. Based on the 12th century rendition of the ten incarnations of Vishnu described in the Gita Govinda and its traditional interpretations in both the gotipua and odissi repertoires, this piece is presented as a conversation between four gotipua dancers, vying with each other to describe the glorious feats of the Lord. Yantra evolved over many years of engaging with odissi movement as meditation and healing. It began initially as a solo of the same name using beej mantras to invoke the Goddess Kali, and subsequently as ‘Akash Yantra’ adapted for three dancers. The piece was revisited after the repertory company was formed, to extend its movement material to include the acrobatic skills of the gotipuas. Yantra’s dancers draw lines of energy in sustained motion, while centering the mind and bringing it to a point of stillness. The piece was later adapted for six dancers as a special commission for the Asian Heritage Foundation’s Bee Festival in 2012. The choreography for this new version explored the idea of a hexagonal honeycomb as a yantra permeated by Devi. The piece explores odissi’s pivots of chowk and tribhanga, with an awareness of the body’s vital points as used in tantric ritual practices. 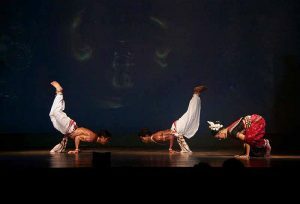 Akash Yantra was created for the Indira Gandhi National Centre for the Arts (IGNCA) and performed at their conference ‘Shaktika on the Ascent’ in Bhubaneswar as a trio with dancers Masako Ono and Dafne Rusam. An invocation to Lord Ganesh. 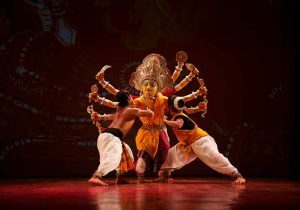 The piece was based on the original choreography of Guru Kelucharan Mohapatra and adapted to include a sahiyatra dancer that joined the repertory company. 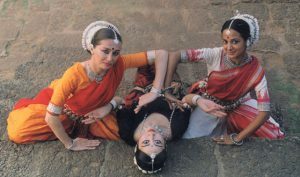 Ahe Nila Saila, a popular piece in both the odissi and gotipua repertoires, was reinterpreted as a dance drama for the Dance Routes repertory group. A play on the five elements, the panchamahabhoothas, as they dissolve from one to another, earth to water, to fire, to air, to ether, in the worship of Shiva. Seed syllables employed in tantric rituals for consecrating the body are offset by a contemporary soundtrack, which mixes traditional instruments and voice with synthesised sounds. The performance was specially commissioned by the Asian Heritage Foundation, and extends the physical skills of 11 traditional dancers into chiseled odissi and yoga, presenting the message of the body being a temple, and the soul within, a spark from the Divine Fire. 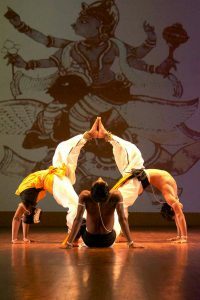 Namasthe Pundarikaksha developed from studio work using the mantras of anganyasa in the yogic tradition, as danced meditation, for the gotipua repertory group. Like Yantra, it evolved over the years and changed form, depending on the number and age of participating dancers as well as their different skills. It addressed the body as a temple where the spark of self-awareness within, was its deity. © 2005 Dance Routes. All rights reserved. boundaries on stage between film and live dance performance. The great Goddess Tripurasundari, embodied in the Sri Chakra, is invoked through a danced geometric diagram conceived as a matrix of abstract forces of Creation. It incorporates the imagery of anganyasa or consecration of the human body to make it a receptacle for Shakti, using the language of odissi dance with yoga and ritual gestures from tantric worship. 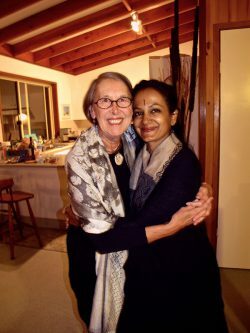 The piece was created and performed as a duet with Laurence Morlon to inaugurate the Festival du Feminin in February 2017, at Sawchu, Auroville. Robyn was instrumental in bringing Rekha together with Michael, and she remained a constant friend, collaborator and photo archivist of all Dance Routes projects since its inception till she succumbed to cancer in 2015. The majority of photos on this website are taken by her. Dance Videos using Robyn’s footage include Shyama and Moksha.